Although the rest of the band would argue the point, Genesis’ initial success was largely dependent upon Peter Gabriel. It was his decision to wear the funny costumes in 1972 that garnered them media attention, and is warped, fairy tale imagery that set the tone for their most important numbers. When he left in 1975 the band’s reaction was very interesting because, for the first time since the beginning of their career, they attempted to be truly democratic. Increased emphasis was placed upon band compositions. And even though Phil Collins became the front man, Michael Rutherford and Steve Hackett also chatted with the audience for the first time and developed their own little skits. Their tour for A Trick Of A Tail, where Bill Bruford from the recently disbanded King Crimson filling in on drums, has passed into legend as one of the best rock tours. 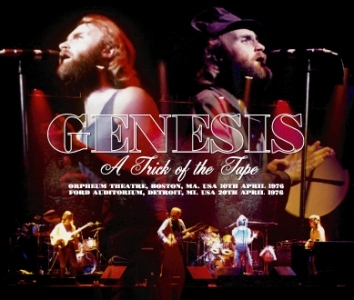 A Trick Of The Tape on Virtuoso contains two shows taken from the middle of the north American tour. Both come from very good to excellent audience recording and this is the silver pressed debut, not only of these sources, but of these shows. Since Genesis’ setlist didn’t vary from night to night there is nothing in particular to commend these shows except for the outstanding sound and performances. The April 10th Boston show comes from a newly surfaced Dan Lampinski master, the taper who has provided collectors with such outstanding sounding shows for the past year. Like all the others, this is a gorgeously recorded stereo audience recording that captures the atmosphere of the performance perfectly. Except for a short conversation the taper has and someone close to the stage obsessed with “The Knife” and who requests the song all night, there is minimal audience interference. “Good evening, Boston. Long time, no see” Collins greets the audience after “Dance On A Volcano” before introducing “lamb cutlet.” After an excellent delivery of the medley Collins speaks Tiresias, the roving reporter in “The Cinema Show” and praises Boston for being the first show without gremlins in the equipment. Collins introduces Bill Bruford before “Firth Of Fifth,” who can “play the drums in thirteen different languages.” When Collins in about to introduce the song, saying: “The next song is…” Several people by the stage keep begging for “The Knife” and finally Collins hears and says, “no, not ‘The Knife.’” It’s a funny little exchange. Hackett gives his standard introduction to “Entangled,” speaking about the perils on a psychiatrist’s couch and it’s inspiration by a painting by his wife Kim Poor. After a very heavy “Squonk” Rutherford speaks about Collins’ tap-dancing and tells the audience to notencourage his dancing “since it goes to his head.” There is some commotion during the quiet opening, but the audience settles down for th rest of the piece. The April 20th Detroit show was previously released on vinyl on Just A Pool Of Tears (Rockwell & Good TMI 1001/2/3) along with some rare BBC tracks. This is the first silver pressed CD title with this tape. It’s another very good and atmospheric recording of the entire concert. There is a small cut at 20:59 in “Supper’s Ready” but nothing substantial is lost. During the opening numbers it’s obvious Bruford is in a creative mood, especially apparent in his funky drum fills during ”The Lamb Lies Down On Broadway” and the rumbling thunder he provides in ”White Mountain” and ”Squonk.” He comes very close to upstaging the rest of the band during this performance. Hackett alters his intro to “Entangled” slightly by speaking about all of the “insomniacs, all of you with recurring nightmares.” A girl close the taper keep begging for “Ripples” but never gets it. While Rutherford is introducing “Supper’s Ready” he explain that Collins will suddenly break into gyrations and “the rest of the group apologizes…it will go to his head.” During “I Know What I Like” Collins stutters out the final line Roger Daltrey “My Generation” style. A long “Los Endos” brings the main set to a melodramatic end as does the encore “It” and a majestic instrumental “Watcher Of The Skies.” A Trick Of A Tape brings these two very good to excellent audience tapes together and is one of the best releases from this tour to surface in a while. The artwork is in keeping with Virtuoso’s design and is excellent all around.